The creation of the Museum goes back to 1967, the period when the Superintendency was pushed, for reasons of security and preservation, to safeguard the important works of art that were at risk of being stolen or scattered. The current district museum was inaugurated in 2000, its collection of artworks enriched with subjects closely tied to the Mugello. The works of art therefore were/have been arranged according to their provenance in this thematic tour that unfolds on the ground floor of the building. The first room briefly shows, with a variety of objects, the various themes of the exhibition tour. Valuable processional crosses from the churches of/ in Olmi and Vicchio, set beside a simple rogation (or processional) cross, indicate the various aspects of devotion and at the same time the wealth of the Mugello’s liturgical heritage, a heritage, a patrimony that, for a long time, has been somehow considered “minor” but which, in reality, includes objects of extraordinary elegance and workmanship. 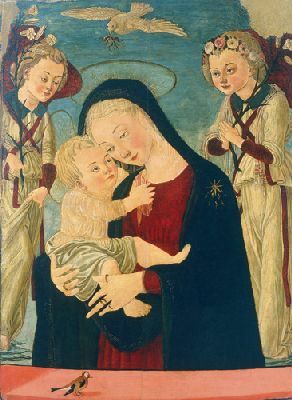 A reproduction of an ex voto offering set next to the famous work of the Madonna with Child and Two Angels by the elegant Master of the Straus Madonna sums up the aspects of two different figurative and devotional cultures. 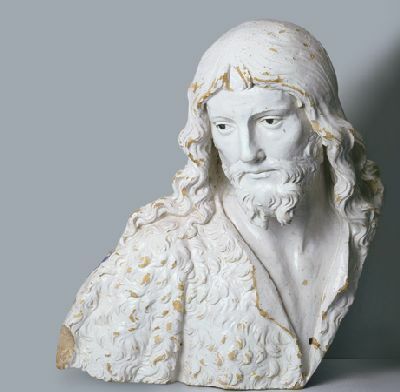 While two sculptures – the fragment with the pensive and delicate face of Saint John the Baptist from a dismembered Della Robbia altarpiece and a terracotta with a Madonna with Child of private provenance and perhaps originally set in a tabernacle – are two different examples of the variety and extent of the district’s artistic heritage and, at the same time, of its dispersion. There have been many events (suppressions, wars, earthquakes, robberies and transfers) that, especially in the last two centuries, have led to these works being moved, lost, or placed in museums. In other words, a series of events have uprooted these works of art and devotion from their original places of origin, thus leading to a loss of identity of the work itself and to a gap in the original local historical context. 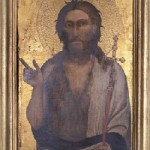 Museo di arte sacra e religiosità popolare Beato Angelico. Simari M.M., Del Gobbo G., Roma, Editore: Comunità Montana del Mugello, 2006. 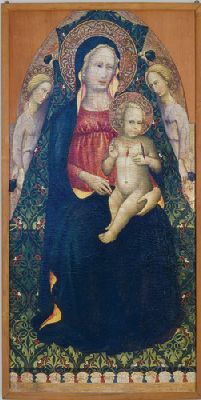 Vicchio, Museo Beato Angelico 1986-1990. AA.VV., Firenze, Editore: Università Internazionale dell’Arte, 1990. 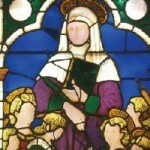 Museo “Beato Angelico”. Chiarelli L., Nicosia F., Santoni A., Firenze, Editore: Comune di Vicchio, 1979. Size: 201 cm. x160.3 cm. 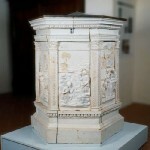 The sides of the panel were cut off when it was adapted over the course of the centuries. 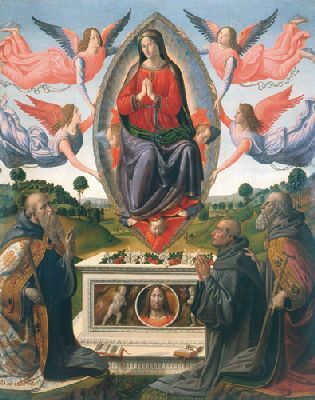 The Virgin is surrounded by angels who support the mandorla encircling her, a symbol of celestial glory. Below, Saint John Gualbert appears on the left, with Saint Benedict on the right as he introduces the praying donor. An elegant sarcophagus overflowing with lilies and roses, symbols of the Madonna’s purity, is found in the center. Size: 126 cm. x 130 cm. 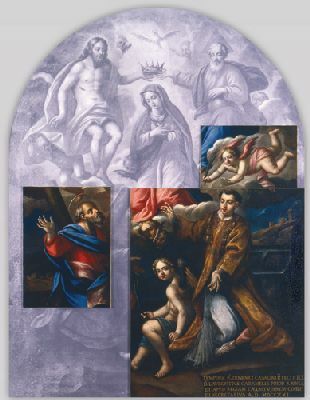 The heterogeneous characteristics of this painting give it a particular fascination: stylized, late Gothic elements are mixed with Spanish and Portuguese stylistic influences and vague neo-Renaissance allusions. Size: 72 cm. x 56 cm. 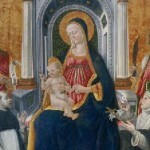 The small painting, from the Parish Church of Fagna, near Scarperia, shows some traits referable to Filippo Lippi’s painting. It can be dated between the 1460s and 1470s when the Machiavelli family were the patrons of this parish church. Size: 117.5 cm. 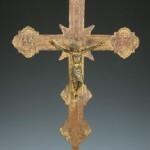 x 92.5 cm. 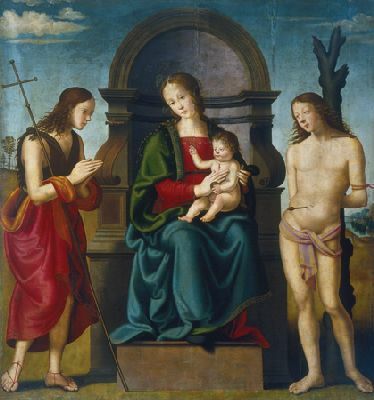 The composition is developed through an intertwining of gazes and poses that connect the four figures in a silent and affectionate exchange of looks. 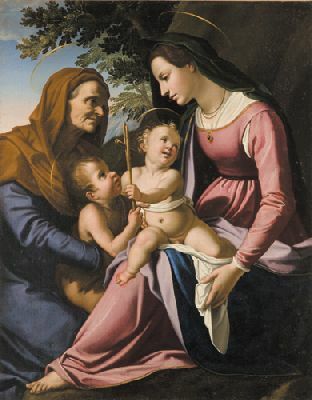 The Virgin and Saint Elizabeth are watching over the two children who seem to be vying for the small, simple cross made of woven reeds, which symbolically joins them in their destiny as martyrs. Size: 46 cm. x 40 cm. John the Baptist is wearing the characteristic goat skin tunic. 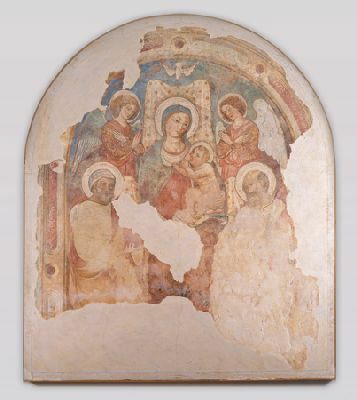 The diagonal cut on the right side indicates that the fragment must have been part of a more complex whole, such as a glazed terracotta altarpiece, a type of object in which the Della Robbia workshop specialized. Size: 122 cm. x 64 cm. 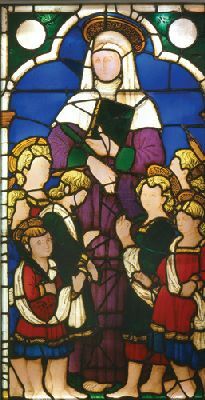 Originally placed in a window in the apsidal area of the Parish Church of Santa Felicita in Faltona this small masterpiece of glass art from the mid-15th century, has been recently assigned to Andrea del Castagno’s circle because of its refinement and quality. 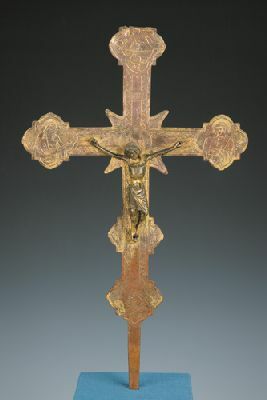 A gilded copper cross that shows Christ on the front with four medallions at the ends depicting a Pelican (a symbol of Christ’s sacrifice), the Virgin, Saint John, and Golgotha with Adam’s skull. On the back are the zoomorphic symbols of the Evangelists, while in the centre is Saint John the Baptist, the titular saint of the Vicchio parish church from where the cross came. Size: 198 cm. x 175.5 cm. 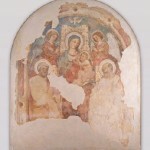 Unfortunately the fresco, the only part of the tabernacle that has come down to us, has large areas missing that nevertheless do not prevent our recognizing the Madonna of the Milk between two adoring angels and Saints Peter and Paul. On the side walls, sources mention the figures of Saint Jerome and Saint Michael, the titular saint of the church near the tabernacle. Size: 118 cm. x 61 cm. 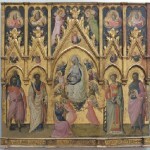 It is the central part of a polyptych, first dismembered and then lost, with the figures of Saint Cresci, Saint Lawrence and other saints unspecified by archival documents. The figures are thin and elongated, the tones and colours are so delicate as to define this painting “all milk and roses”. Size: 66 cm. x 40 cm. 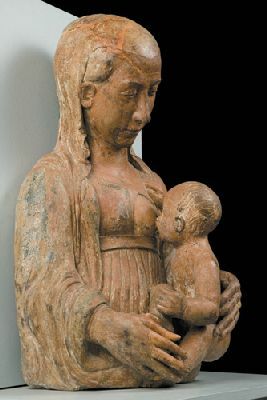 This terracotta piece comes from a tabernacle set on the façade of Casa Lapucci in Vicchio. 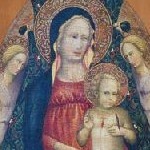 Traces of the original polychrome can be seen on the Virgin’s mantle. 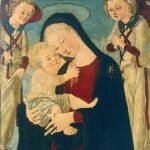 The iconography adopted here is that of the Galaktotrophousa Madonna, who is depicted as she tenderly suckles Baby Jesus. Size: 171.5 cm. x 133.5 cm. 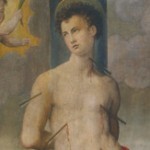 Stolen from the Church of Santa Maria in Olmi and later recovered, the painting is a traditional representation of the martyred saint whose heroic and athletic figure rises against a background enlivened by archeological monuments inspired by ancient Rome. Size: 221 cm. x 160 cm. x 120 cm. 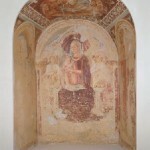 The detached frescoes of this small cycle come from a chapel-shaped tabernacle standing at a crossroads. 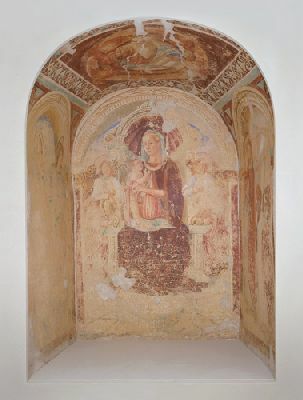 The Madonna and Child Enthroned is in the middle, in the small vault there is God the Benedictory Father and, on the side walls, two pairs of saints: Saint James and Saint Anthony on the right and a Bishop Saint and an unidentified young saint on the left. Size: 120 cm. x 85 cm. The font has a hexagonal structure with six panels, separated by angular pillars, depicting scenes from the life of Saint John the Baptist. 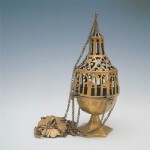 The surface is entirely glazed with the addition of gilding and touches of cobalt and manganese. Size: 167.5 cm. x 191.5 cm. 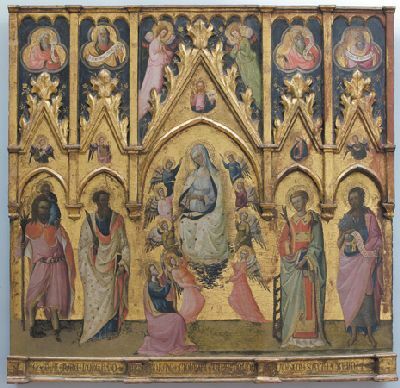 The refined panel, known as the “Pimonte altarpiece”, depicts around the well-defined architectural structure of the Madonna’s throne, Saint Reparata and Saint John the Baptist, the protectors of the city of Florence. To the left is Saint Bartholomew (perhaps the client’s patron saint) and Saint Anthony the Abbot, a venerated figure in the Mugello countryside. 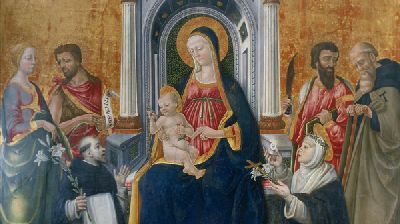 At the foot of the throne are the figures of Saint Dominic and Saint Catherine of Siena that are inconsistent from both stylistic and iconographic points of view, and were probably added later on. Size: 153 cm. x 145 cm. Size: 62.5 cm. x 37 cm. 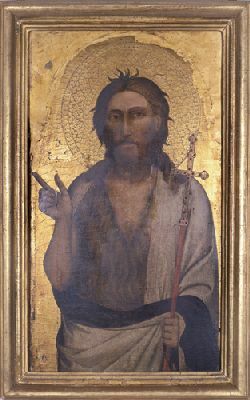 The only remaining part of a lost polyptych, it was probably the main side panel as it portrays the church’s titular saint. The high quality of this painting is evident in the austere yet reassuring figure’s solid layout and in the suffused delicacy of the painting. Size: 70.5 cm. x 52 cm. ; 122.5 cm. x 103 cm. ; 37 cm. x 57 cm. 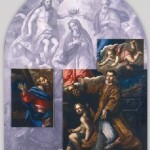 The altarpiece, which originally depicted the coronation of the Virgin and Saints Andrew and Lawrence, was stolen in 1993. 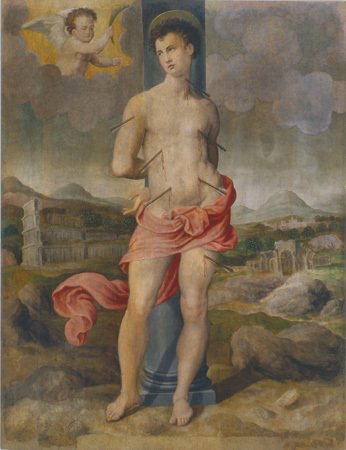 In order to sell the painting more easily and to make it more difficult to recognize, the canvas was cut into many parts. These three fragments were recovered some years later and are displayed in the Vicchio museum. 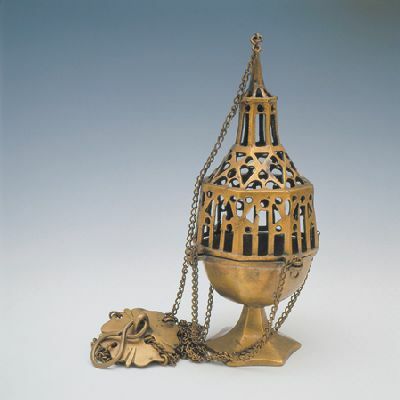 In the shape of a tempietto, this thurible has a multifoil foot, a hemispherical brazier, and a fretworked cover with triple-arched and geometrical motifs. From October 1st to May 31st: Sundays 10 a.m.-1 p.m. and 3 p.m.-7 p.m. It is possible to have special openings upon appointment for groups outside of regular hours, upon written request addressed to the Ufficio Cultura which will verify the availability of personnel to open the museum each time. From 1 June to 30 September: Thursdays 10 a.m.-1 p.m. and Fridays, Saturdays and Sundays 10 a.m.-1 p.m. and 3 p.m.-7 p.m.
Free of charge up to 6 years of age / differently-abled escorts / class teachers / accredited journalists / group leaders. Vicchio Schools workshops €. 2.00 per child.